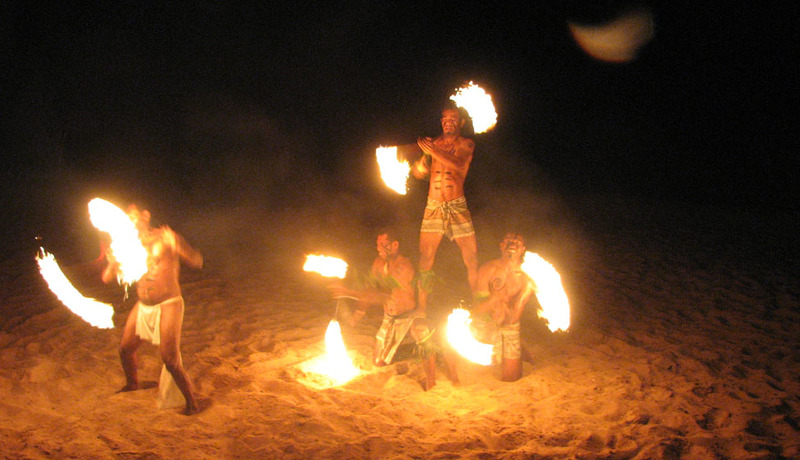 There is numerous fire dancing arts, although four general categories are recognized. Fire eating involves extinguishing fire in the mouth, and can be done at the culmination of a dance performance or as a standalone act. Many fire eaters dance with lighted brands attached to their hands, and close the performance with a daring fire eating display. Fire breathing involves holding flammable fuel in the mouth and igniting it to create a flaming jet, which can be quite stunning, but also rather perilous. Fire poi is a fire dancing art where dancers use chains with balls of flammable material at the ends to create swooping and swirling fire dances. Fire staves are somewhat safer than poi, because they can be manipulated much more slowly, and are a good choice for beginners. Safety is extremely important for fire dancers. Most performance artists recommend that people interesting in learning one of the fire dancing arts train with a professional, and be prepared to reach a high level of confidence with unlit items before adding fire to the mix. Many fire dancing organizations around the world offer training and referrals to professionals who are willing to accept apprentices. If you are interested, you can use your favourite search engine to find a local fire dancing organization. While performing, a number of steps should be taken for safety. Fire dancers always wear comfortable, form fitting clothing made from natural fibres, as materials like cotton do not ignite as readily as synthetics. Hand protection in the form of Kevlar gloves is often used, and fire dancing equipment is usually obtained from a professional source and kept in excellent condition. The wicking and fuel area is kept separate from the performance and lighting area, and dancers must be aware of the audience and environment at all times. Fire dancing should never be performed alone, during the dry season, while intoxicated, or without fire extinguishing equipment nearby.